And revolving at 900 miles an hour. But out by us it’s just three thousand light-years wide. Twelve million miles a minute and that’s the fastest speed there is. This entry was tagged astronomy, music. Bookmark the permalink. I think it’s so intriguing that humans have managed to discover a world completely different from ours, outer space!!! And that we’re not the only ones in this entire universe, despite the fact that sometimes it may feel like it. I think that all these technological advances & discoveries throughout the centuries are something that the human race ought to be proud of. We’ve discovered so much yet so little about our potentially infinitely complex universe, you can’t help but wonder what will be discovered in future years/generations. I believe that outer space is a different world, like Andrea said, that is yet to be discovered and has extremes which will take many many years in order for scientists to find out! But with time, a lot of time, I think we will be able to discover each and every one of these extremes; which will help us understand the world and its complications perfectly. 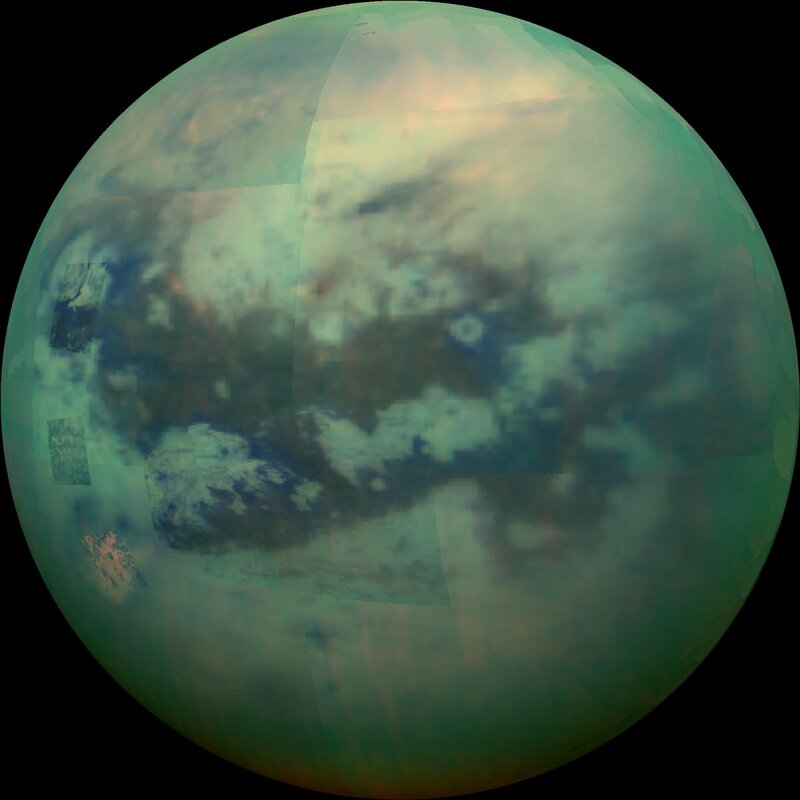 I would not be surprised if we find unicellular type of life in one of these candidates before the XXIst Century is over: Enceladus, Titan, and Europa. I suggest you do some research of each moon. It’s amazing how scientists have come to discover a completely different world. A world unknown to us and that we know so little about. In the future, scientist will find stuff that we wouldn’t ever thought that we would find. Actually, that is happening almost on a daily basis. Take the example of the dwarf planet, Ceres. As recently as yesterday, for the first time in history, we were able to successfully reach its orbit. Our universe is grand and endless. This song is definitely a fun way to open your eyes to all the possibilities in our universe. So many things could be living in it under our noses. As it said, we are a rarity, we are minuscule compared to the universe itself. So, why do we waste our time feeling sad or angry when we should be happy to be alive in such a huge and inexplicable area. We are not alone in the world, much less in the universe, so one should never feel like it. We have discovered numerous things about the universe and yet nothing at all, for it is limitless and it won’t stop developing. But we should be proud of what we’ve done and keep progressing, never let ourselves down. We may be competing with other types of life across the universe right now and we don’t even know it! The film is great. I’m a huge fan of silly British humor, especially of the Monty Python kind. But in this case we can actually learn something. Also, these guys are pretty smart. Their comedy is peppered with references to poetry, philosophy, and science. In my opinion it can be scary in a way but in reality it is so amaizing all the things humans have discovered and all the things that are yet to be discovered. In my opinion there is definetley life that hasn’t been discovered yet. What will be the reaction of humans towards the discovery of other life? We don’t know, but it will certainly be a great scientific discovery and a great advance in science. It is scary. Considering the utter chaos that can result from such a discovery. It is most certainly shocking and incredible that we are able to recognize the huge universe that we call our home. What is even more intriguing is that the world is filled with mysteries that are yet to be discovered, which adds a bit of tension and the need to know more about the universe. Scientists discover hundreds of planets every year, even some that are not supposed to exist based on current knowledge about outer space. Outer space definitely has to be more appreciated sometimes! Extraordinary isn’t it? Many people on this planet are oblivious as to what is happening in their surroundings especially in the cosmological scale. Imagine if the publics interest could be sparked and be inclined towards studying and exploring the eccentric stars, planets, and who knows even quite possibly the galaxies around us in the future. I for one agree that the ignorant population of mankind should be exposed to the information related to ever growing cosmos. maybe we are just the speck of sand in the universe, and to think that with every passing second the universe keeps growing! I believe I do not read enough nor am i informed enough to even start getting amazed by what could actually be out there. Most of the documentaries are so limited, they all specify of what each planet is made of and approximately when it originated, but it sure would be cool if for just a second we could have something like the aliens in the movie of Indiana Jones , where the let the woman have a glimpse to what actually exists and we haven’t even began to dream about. I think that this song is a fun take on the subject at hand. The universe is a vast and timeless place. One in which many people believe that we are alone in, but that is not necessarily true. The universe is expanding and will keep expanding so it is somewhat naïve to think that the possibility of some other life form(s) is completely impossible. Remember that Earth is just a small dot compared to the entirety of the universe. It is amazing how the solar system is just a speck of dust compared in size to the ever expanding size of the universe. Considering this fact, it is even more amazing how human beings are so tiny compared to other things in the universe like the Milky Way galaxy and other close galaxies like the Andromeda galaxy. It is even more incredible the sheer size of some objects found by astronomers in the universe. For example, just recently astronomers found a huge black holes that is estimated to be as big as 12 billion (12,000,000,000) sizes of the Sun and its discovery has even been suggested to be able to change the theory on how the universe began. 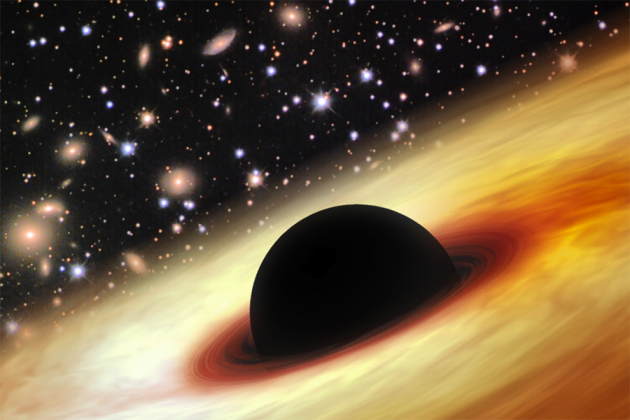 That black hole is one of the most mind-boggling objects ever discovered. The image posted along with this song is an artist representation of it. This is a really creative way of learning about the vast subject that is the universe. Attempting to even think about the enormity of the universe is astonishing. In perspective, the earth and we humans are merely nothing which is completely mind-blowing. There is so little we know about black holes, yet there is enough information to speculate or theorize the possibilities of what a black hole is. I read this article and I was amazed by what a black hole can do. What the black holes did was release enough energy to give birth to a star in the center of multiple galaxies. This is the process that our solar system once took to create our planets and moons. This could mean that if the milky way turns int a star we would be the debris to create planets and moons in this new super solar system that is trillions of times bigger than ours, so we would be smaller than an atom in this new super solar system. This song is such an amazing way of perceiving the universe and how extravagant it truly is. It is a creative and educational way to show how we are so small, microscopic even, compared to what is out there. To think that there is so much more that we don’t know about and the possibility of other life in the universe is exhilarating. The truth is, we are almost nothing. There is so much out there that is still unknown, and even more that will remain a mystery. It wouldd be selfish to think there is nothing else outside of our galaxies or in our universe, and as time goes by humans will contribute to the previous discoveries that have been made, either to correct or to add knowledge. Astronomy and space are really interesting subjects that sometimes go under rated and that a big portion of this ignorant society is indifferent towards. But I also believe this is not our fault. The media is not the best promoter of out of this planet research and accomplishments. only people who are intrigued by science are aware of the many things scientists are able to discover in space. Also, some things are better left unexplained to the common people, because understanding astronomy or the science that explains the universe may be too complex or hard to understand for those who only have the basic knowledge in science. I think the song posted is very fun and accessible to many, i liked it. I find it interesting how this song can give you some insight about our galaxy in less than 3 minutes. Things like these make learning more dynamic and somewhat easier to understand/grasp especially if we’re talking about something as complex as the universe. It’s funny how sometimes you start thinking about the vastness of the universe and you completely re-evaluate your entire existence, because after all we are just a tiny speck of dust in a limitless universe. We may think we know a lot about the universe and we have made amazing discoveries, but because of its constant expansion and development there is still a lot to figure out, explore and discover. This song makes me think of all that could be “out there”. Even though humans have vast knowledge of the universe we are not even beginning to fully understand many phenomenons. This song compacts many known facts about the universe surrounding us in a very creative educational technique. It accentuates the theory of universal expansion and how there are still vast areas of the universe that are yet to be discovered. That’s the genius behind the song: it compresses a lot of information in a very short amount of time. I believe that’s what makes it funny as well. I can’t believe how we are less than a speck of salt compared to the universe and even lesser in other galaxies. It’s amazing how big outer space can be. Here is a link that shows how galaxies can collide. Very interesting. I think its incredible that there is so much to explore out there. That how big the universe actually is. There is also a possibility of, there being life, intelligent life out there. This song puts me to think how insignificant we as hum as actually are in this ever expanding eternal universe. With this song to learn that we are actually also unique being intelligent beings. And how for us we see our lives passing with each day, and so much is happening in the galaxy, and that there is still so much we don’t know. Meaning there is so much to explore. What is the greek etymology of the word ‘galaxy’? Are there any carbohydrates that share greek etymology with ‘galaxy’? I am glad that Monty Python has a song like this. Its a strange feeling of awe and satisfaction when you hear that the universe is unimaginably big. The Milky Way has billions of stars and the observable universe has billions of galaxies. When you compare the wonders of our universe to our problems here on Earth, it feels as though those problems become insignificant along with everything else. I am satisfied with our insignificance because the difficulties of life are so trivial which relaxes me, and yet in our little world, life is so complex, which fills me with awe. I believe that the song is very useful for students to learn more about our galaxy and the universe. It provides a vast amount of information in less than 3 minutes. The use of a song, instead of plain data allows for easier comprehension and memorization of the information. This song talks about the reality of our existence, how we are just about nothing in comparison to the universe. I would recommend this song to someone having a hard time learning and/or studying for a test, due to its simplicity and effectiveness. Google ‘the human condition’. Maybe that concept can shed more light on the philosophical aspects of Being. I believe that the song does a brilliant job of teaching a bit of information about the wonderful and grandiose galaxy. It does a great job of mixing in a nice beat, but still keeping room for knowledge and the message it wants to give its listeners. Thanks to this song, I now have more knowledge on the galaxy and the sun. As mentioned in the song, Earth is constantly evolving and revolving at 900 miles an hour. Another quality that this song has that it is quite terrifying, thinking about how you are so, so small, in such a vast universe. How the Milky Way is one of millions of billions. It is the frightening, yet beautiful truth. Galaxies “revolve” around black holes–objects of immense densities. “Evolving and revolving” happens at the molecular level too; this is how polymers of high complexity emerge. DNA’s double polymer spiral “revolves and evolves”; this is how mutations–just to name one example–emerge. Having a song as a representation of the Galaxy which in deed is a very complex and debatable concept, gives us a new and aspiring way of learning. In this short amount of time, I learned that our galaxy has more than a billion stars which is very impressive. I believe that a new planet is capable of forming since our galaxy is continuously expanding and who knows maybe in a near future scientists discover another planet that will be well suited for all life processes. This song shows us how vastly complex and grand in size the universe is. In just three minutes, I learned that we revolve and orbit at an incredible speed and that there are a hundred billion stars in the galaxy among other things which is very impressive and left me quite astonished. I think this song is a great way to learn about the basics of the universe so you can understand it better and be open to the idea that the universe is something immense. I also learned that the universe as we know it is very old, meaning many millions of years before we even came to existence. Our planet is always evolving and the universe expanding so who knows what they will look like in a couple million years. This song teaches us a lot of information in just three minutes. I believe this song is very useful for students to learn about the universe, which is very important. I learned that we are very small in the universe, there are billions of galaxies out there, which is quite terrifying. I also learned that there are billions of stars in every galaxy. The universe is immense, there is so much to explore, I think we have to keep searching the universe to see what amazing things we may find. Monty Python has taught me a lot—philosophy, astronomy, history… Art can be a very powerful tool for learning, especially comedy. It’s great how in a song you can learn so much about something huge and mysterious as space. In two minutes of hearing the song you learn facts about space that are suprising and unimaginable. Space is a vast place which we don’t know much of yet but scientists have made groung breaking discoveries in the last years that scientists in the past would laugh in their faces if they heard them. In the future, maybe we can find a suitable planet that humans can survive or even another species similar to us. The universe is immense, that is why it is amazing to know the different ways to explore the unknown to us. This song helps remember what the galaxy is composed of easily and in a fast way. I think that in addition to searching for new things, Scientists should go beyond their limits and create fun songs and other songs to motivate and inspire more people to learn about the world we live in. Great quote by André Gide. Exploration of any kind—psychic, cosmic, etc.—requires courage. It is basically human nature to ask questions, to explore. This is something that Art and Science have in common: both of them are ways of being a human being. The universe is so incredibly massive that anything and everything we do is insignificant in the bigger picture. We literally have explored less than 5% of the ocean, which covers more than 70% of the Earth. Even though we do have a map of the ocean floor, it’s resolution (5km) is even less detailed than maps of Mars, the Moon, or Venus because of our planet’s watery veil. So if we have explored that little of our own planet just imagine what could be out there in the depths of space. This song really makes you feel small and insignificant, but at the same time it makes you feel lucky to have been born at all. Just knowing that light is the fastest thing in the universe and that it takes thousands of years just to get from one point of a galaxy to the next is really amazing. But, also knowing that the chances for a planet to actually contain sentient beings and life in general are low also makes you think about how lucky you are to have been born at all. This link talks about the probability of life in planets found in the Milky Way Galaxy. I think that this song is a good way for people to learn more about our galaxy and our universe because it shares a lot of information in a small amount of time. Also, learning through music makes it more fun and easier to comprehend. Some of the facts the song says are impressive like for example the size of the galaxy and the speed in which it moves. I would recommend this song to anyone who would like to learn more about Earth and astronomy. I agree with the song. I think that we all work together. We are all part of a system and each part needs each other to function properly. Since everything was created from one thing that means that we are all the same just divided infinite times so then diversity was created but in a way you can put us all back together and get what you had at the beginning just like entropy. After the caos we will go back to what we were before anything existed and the cycle will repeat. I think it would be good to show this to kids so they can see the bigger picture and by then when they’re older they would understand the world better. For them, they think that the world is just what they see, and for them that’s big. They will be slapped by reality once they see for themselves. It would also make it easier for them to understand since it is in form of a song. People can be visual or focus more on the ear. I, for example, am both. And also i would like the add that with this song they would know that they are not the only ones growing up if it makes any sense. The universe does seem to keep on expanding it it’s scary to think that we live only to see probably an millimeter of what is the life of the universe. The song presented has a very positive vive for the young generation to get a clear view of the mystery of the universe. I think that is very impressive that people have discovered a totally different world compare to what is known as Earth and that is space. It is important to realize that in the universe we are not alone. In the future their will be unexpected discoveries by our scientists. I find it so intriguing that our planet is just a spec of dust compared to the rest of this universe, we are so small and yet so alone, or so we think. I would not be surprised if in the next century or so we would be fortunate enough to encounter other forms of life in our galaxy or in nearby galaxies, it would truly be the scientific breakthrough of the millenium! In this website we can see how there truly is hope to find alien life on other planets and confirm that we are truly not alone, Kepler-452b is a perfect example that we have a genuine chance at achieving what will possibly be one of humanities greatest achievements, and that it is not that far into the future as we think.